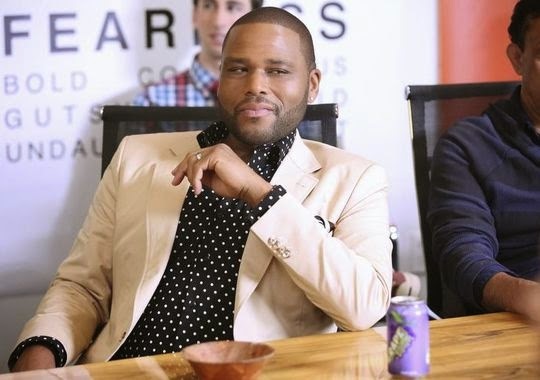 After weeks of impassioned online debate about its title, the new ABC show Black-ish finally premiered last night and immediately took Twitter by storm. From those who felt uncomfortable by the show's all-too-real commentary to others like myself who found a kindred spirit lying underneath the jokes and traditional family sitcom format, ABC did at least one thing right -- started a conversation. But for many of us, the dialogue it's sparked is not particularly new (these are things we discuss regularly among our own in our communities); it's just now it's on national primetime television during an era many have considered "post-racial." 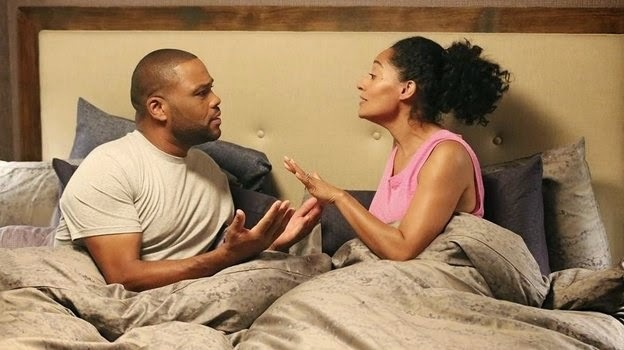 So many times throughout the 30-minute episode I found myself nodding during certain scenes and praising Black-ish for being not only genuinely funny (its lead actors Tracee Ellis Ross and Anthony Anderson are hilarious), but also daring, smart and, yes, uncomfortable at times. That's what all great shows of any genre should do -- provoke thought and emotion. And if you can apply it to your own lives, if it offers a personal truth that you feel is absent from other shows, all the better. 1) Using colorism to define someone's level of blackness: During a heated conversation on the episode, Andre (Anderson) tries to negate an opinion his wife Rainbow (Ross) has on what it means to be black by using her lighter skin tone and biracial identity as a way to discredit her. I believe he even goes as far to infer that she's not really black, and therefore can offer no authority on the subject. This is a scenario that too often goes undiscussed within the black community but still persists. 2) Struggling to navigate your own identity within an unspoken responsibility to your entire race: Andre and Rainbow's eldest son, Andre Jr. (Marcus Scribner) is going through a bit of an identity crisis -- or perhaps an identity awakening -- when the family moves to a new (read: mainly white) neighborhood and he develops new friends at school. As a result, young Andre, whether it is due to peer pressure or natural adolescence, begins assimilating with the predominant race -- to his father's chagrin. Experimenting with a name change and (gasp!) religion switch, he gives off an impression that he's trying to be someone who he's not. A defining moment in the episode is when he tells his that he's not trying to be anyone but himself (a paraphrase, but that's the gist of the sentiment). 3) Becoming the go-to expert for all things black: This scenario admittedly made me cringe as well as LOL because it's so sad but so true. Andre is in line for a great promotion at his job, so his confidence is sky high. So much so that not even the obligatory encounter with his white male counterpart, who asks him yet again how to translate something into blackspeak, can break his stride. But when it comes to the big announcement of his new status at the board meeting, he learns that he's actually been promoted to the Senior Vice President of the "Urban Division." (The jury is still out on what this would even entail, but the assumption is that black people are already supposed to know). 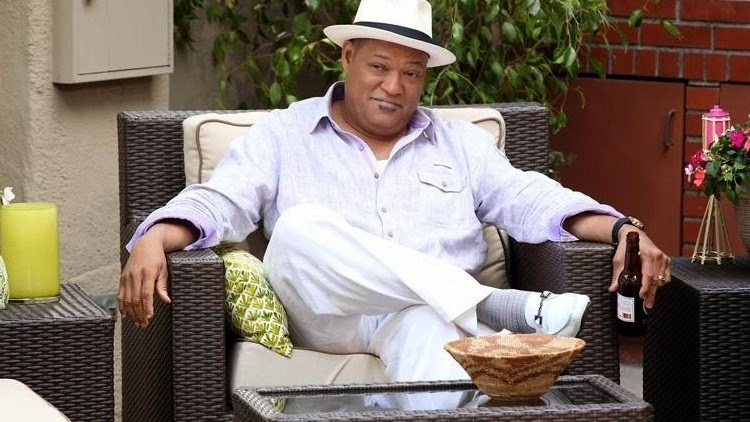 4) The grandfather who is wondering when it all got so complicated: While I am still in disbelief that Laurence Fishburne is now playing a grandfather on television (time flies! ), I have to admit I kinda loved him on the show. Pops isn't in many scenes, but he sure makes an impact as the patriarch (Andre's father) who comes in just to offer a much needed side eye or brisk one-liner before he picks up his newspaper and checks out again. He's not of the generation when identity has become a matrix of discussion and provocation, he's not from the time when parents had an extravagant black intervention with their kids about race. He understands race and identity as black and white, that's it. The rest of the dialogue is just white noise to him. Clearly Pops was modeled after my own late granddad who had no time for this kind of debate. 5) That awkward moment when the food you eat brings your blackness into question: Rainbow didn't have a whole lot of splashy moments on the pilot episode, but I could already see that she is going to represent the so-called "progressive" black parent, the one who sometimes coddles but also supports her kids no matter their quirks. She's a little bit hippie, a little bit bohemian -- but is quick to check somebody (even if it's her husband) when they try to say her opinion or professional responsibilities aren't important. So when Pops calls her out for serving the family baked fried chicken instead of fried fried chicken, saying the real thing was apparently too black for her, it definitely hit home for me. Everything from the food you eat, to the clothes you wear, to the shows you watch, to the way you speak is grounds for cultural judgment. It's been a few years since a 30-minute primetime black family sitcom has explored some of nuances and complexities of black culture (Everybody Hates Chris comes to mind). 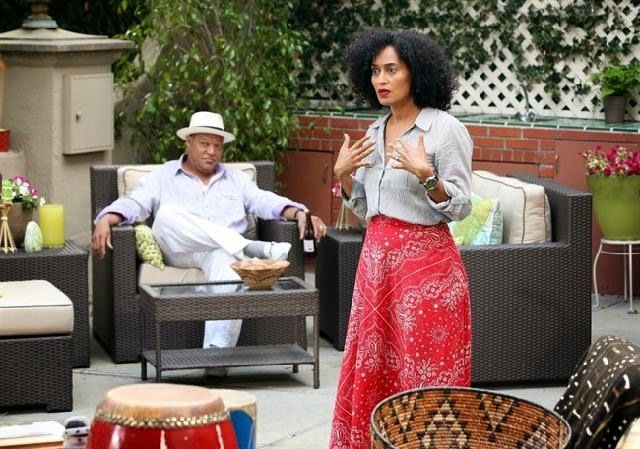 I definitely hope Black-ish sticks around. It's off to a great start. 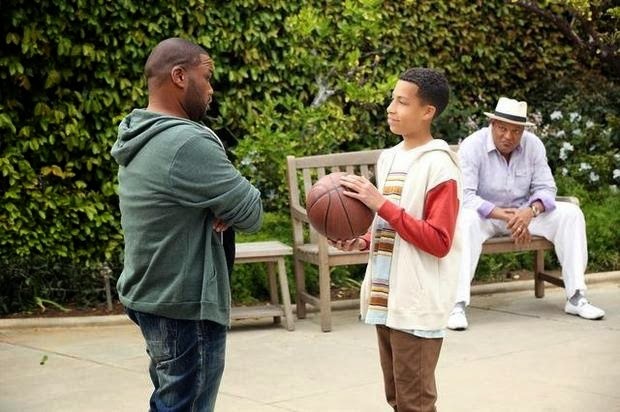 Black-ish airs Wednesday nights at 9:30pm/8:30pm CST on ABC.